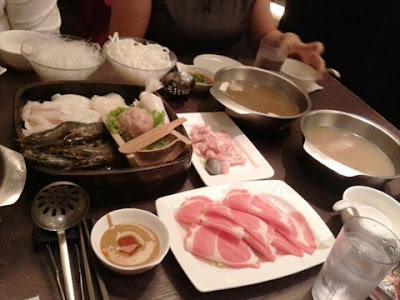 Steamboat or Chinese fondue, refers to several East Asian varieties of stew, consisting of a simmering metal pot of stock at the centre of the dining table. It is believed to have originated in Mongolia and got popular in China during the time of the Tang dynasty. Over a thousand years old, it was essentially a winter treat of stewed meat and vegetables. It’s the self-cook aspect of steamboat that that makes it unique. In the modern world, the coal heated steamboat has been replaced by electric, gas and induction gas heaters. 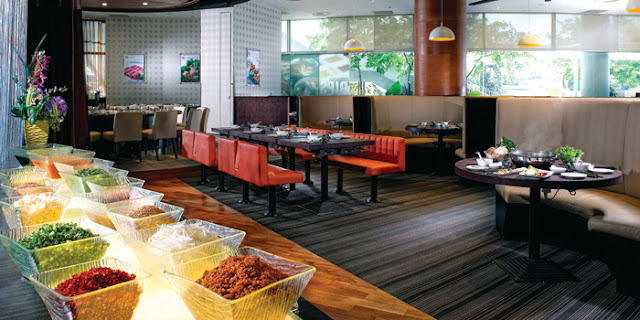 In equatorial Singapore, the winter mood that goes well with 'steamboating' is created by the excess, sometimes severe cold, caused by air-conditioning in the restaurants and malls. 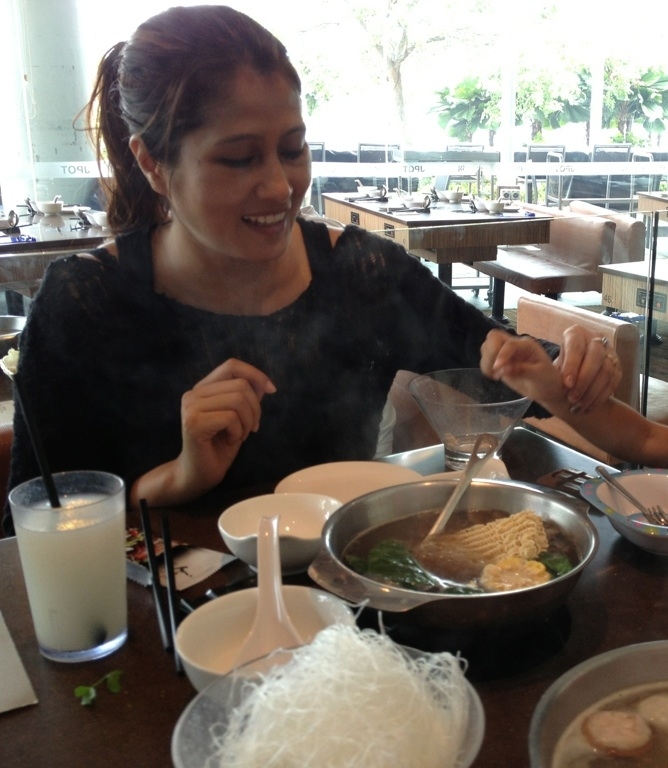 So at JPOT, VivoCity mall, Singapore, we - a delighted bunch of five - bravely dived into the 'steamboat '. Bravely, for, three of us were first time steam boaters, and the two who invited us into the experience were (I guess) concerned about that fact. The staff was polite, helping us to a table installed with four heaters. 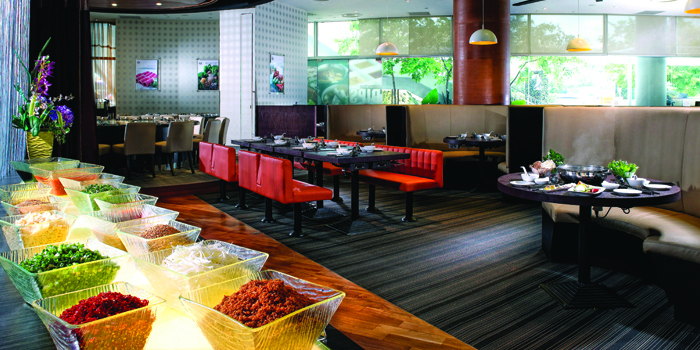 They showed no obvious signs of alarm at the sight of non-Chinese diners. Nor did they jolt on hearing that they were vegetarians, a very rare race in noodle land. God bless them. Clearly no Amy Cheongs there! Bowls, each with soup and a corn piece that gave away lovely aroma, were brought and put on the table heaters to boil. As we browsed the menu, we happily found out that it had a good spread of vegetarian ingredients. 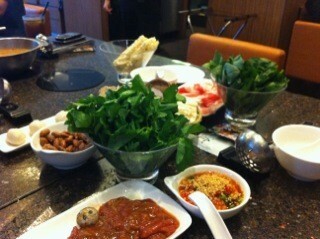 When the food got on the table, we were amused at the sight of fresh green, fresh meat and raw noodles. All of them were to go into the boiling hot soups in the four bowls and create some kind of eatable potion. The next step was to go to the sauce section. We did our pick of different accompaniments; put them all in a small bowl to make a sauce that was to go with the main food. I thanked God for the divinely red, rich garlic and chilli sauce which I mixed with a dash of sesame oil, spring onion and coriander leaves. Heaven! holds the hand that...holds the spoon! My dear husband, who's a fan of bland food, skipped the sauce ritual and jumped into the boiling experience. Happiness never left his face as he dipped raw veggies, seaweed and noodles into the hot bowl of soup that itself looked hungry for some action. I guess he felt like a magician, being able to cook on his own, in such a relaxed way; and multi-tasking it with lazy Sunday talk. He relished every bit of his steamboat. He didn't even spare the poor corn piece, with all its flavour gone into making of the soup stock! 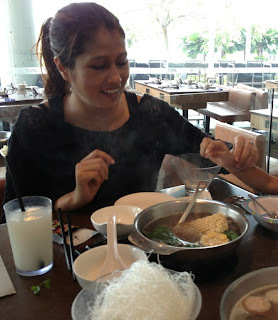 My daughter was my steamboat angel who devoured a couple of lovely fish balls and noodles which she proudly ‘dived’ into the bowl. Ours was a table with two sides. One side a contented picture of a couple enjoying their normal steamboat of chops and prawns. And, on the other, an almost vegetarian family munching away stewed kang kong and spinach leaves, emptying plates of good old bean curd and sweet potato. All this, with glasses and glasses of cold barley water and happy talks on bucket lists of places to go and things to do, made one satisfied, grateful table. The staff's etiquette was commendable. It feels good to know that I can always come back, maybe with a bunch of first time steamboaters (maybe vegetarians!) and be confident that the host restaurant and its food will be warm enough to guide them to yet another great experience! Hmm...sounds like gastronomic delight. A few years ago, I got to try that in Bangkok. I remember eating away to glory using my newly acquired chopstick skills. Might not sound very appealing for the vegetarian tribe, but I ended up tasting squid as well. Would love to try the Bangkok version. :).Squids.hahhaha.I last saw them in Bombay!